With so many different types on the market, it can seem virtually impossible to know which pillow is best! The temptation to simply buy the cheapest or the first one you see is all too real. However, what many people don’t realise is how important your pillow actually is. As we spend up to a third of our lives asleep (so a third of our lives with our head resting on one! ), it’s essential that our pillow allows us to drift off comfortably while also providing us with adequate support throughout the night. Too many of us suffer from back and neck pain, exuberated by hour after hour sat at a desk or behind the wheel of a car. Choosing the right pillow for you will help to mitigate this pain. Choosing the wrong pillow on the other hand, could make things worse. That’s why it’s essential to put some time and effort into figuring out the best pillow for you – and we’re here to help you out. The first step is choosing a pillow material. Different materials will work for different people – we all have our preferred positions and unique aches or pains that will determine our choice of pillow material. We’ve put together this guide to help you choose the right pillow material for you. From memory foam to buckwheat, we’re confident that this guide will help you figure out what it is you need in a pillow, enabling you to sleep better, longer and more comfortably. First up is memory foam, an extremely popular choice of pillow material due to its high density and viscosity. We have NASA to thank for this type of pillow, as memory foam was reportedly first discovered by them while looking for a way to increase cushion safety. Since then, memory foam has become a best seller, used for pillows, mattresses and mattress toppers, promising sleepers a comfortable and supportive snooze. So how does it work? Well, those of you who are familiar with memory foam will know that the material moulds itself to your shape. It reacts to your body heat, shaping itself around your head and neck. Without the warmth or pressure of your body, it will slowly bounce back to its original shape – with the length of time it takes to do this depending on the quality of pillow you have purchased. If its popularity is anything to go by, memory foam is a great choice for practically anybody. It provides a natural, even stability which doesn’t let the sleeper ‘sink’ down into it as they may with other materials. This makes it ideal for people with back or neck pain. In fact, cervical pillows specifically designed for those with neck pain are often made from memory foam. Memory foam pillows are also usually very comfortable – although this of course depends on your own personal preference as they certainly offer a firmer feeling than many other pillows. Finally, memory foam pillows are durable, quiet and smooth. Some memory foam materials have an unpleasant odor when first unpackaged. This is due to a process called ‘off-gassing’, which starts when the memory foam comes out of its packaging and is due to a build-up of gas in a tightly compressed space. While this may be slightly off-putting, the smell is non-toxic and should dissipate if you air the pillow for a day or two. Memory foam can also be heavy, which makes it difficult to take anywhere – for example on long flights or car journeys. Memory foam can also get very warm, which can make summer night’s uncomfortable. As they are heavy and dense, it is difficult for the air to circulate so if you’re someone who often gets too hot in the night, it’s worth choosing a material which ventilates air slightly better – or at least invest in a pillowcase specifically designed to keep cool, such as bamboo. Finally, memory foam is relatively expensive which puts a lot of people off purchasing it. However, with so much of our time spent asleep, we firmly believe in investing in something that your future self will thank you for! If it’s comfortable and helps to ease aches and pains, a memory foam pillow is well worth the little extra cost. While standard memory foam pillows consist of one solid piece of foam, shredded memory foam is the same but, you guessed it, shredded. This makes it softer and marginally less stable. So why choose a shredded memory foam? Well, it usually offers more ventilation than the standard – and with lack of circulation one of the main drawbacks of traditional memory foam, this alone is enough to sway most people. It’s also supportive and comfortable, while allowing the sleeper to ‘sink’ slightly more which, for many people, is more comfortable. Many shredded memory foam manufacturers allow you to adjust the filling yourself. This means you can pad it out if you want a little more support, or take some filling out if you feel it’s too firm. Traditional memory foam pillows don’t offer this customisation, so it’s a great option if you’re slightly pickier about the height of your pillow! Shredded memory foam is much softer than standard memory foam, but doesn’t mould to your shape quite as well. While the height of standard memory foam is usually fixed, shredded memory foam offers a more variable height. Moving around in the night a lot will change the shape of the pillow so some of the typical memory foam stability is lost. Of course, whether you see this as a positive or negative really boils down to your own preferences. While some people want something very supportive and sturdy, others need something a little softer. Next up is the down pillow, another extremely popular choice. Contrary to belief, down and feather are not the same. In fact, down is the fluffy insulator that lies underneath the feathers of a duck or goose. Goose down is usually the fluffiest and the best quality. Down pillows are light, meaning they’re ideal if you want to travel with your pillow. They also regulate their temperature very well, conserving body heat and keeping cool in the warm weather. They hold their shape well, providing good support for stiff or achy necks and work well for all sleeping positions. Finally, there’s a wide range of levels of firmness available. The higher the fill number, the firmer the pillow. Like all the materials listed, there are certainly some drawbacks and with down pillows it’s the durability. While they can be easily fluffed up when they start to sag, there is only so long you can do this for. Eventually, down pillows will begin to wear and a new pillow much be purchased. If you live in a humid climate or regularly wake up sweating, you may want to look for something else. Any moisture present is absorbed and will eventually break down the pillow. They are also difficult to clean, usually needing to be dry cleaned, and pure down (no feathers) is very expensive. Finally, down pillows are not cruelty-free. Ducks and geese are often killed for their feathers. Either that, or they are plucked live. Neither of these processes are particularly humane and this is likely to put many people off. Next is the trusty feather pillow. Usually consisting of both down and feathers (whereas down pillows will contain only down) feather pillows have many of the same benefits as their down counterparts – for a lot less cost! Feather pillows are light and malleable. They can be folded and moulded to suit your particular way of sleeping, and they don’t get too hot. Like down pillows, they can be fluffed up every day to bring back their natural shape. They aren’t lumpy, and provide adequate support. They can also be washed and dried easily. Finally, they are both durable and affordable! With reasonable care, feather pillows should last for up to ten years. Despite being overwhelmingly popular, feather pillows do have their downsides. While they may provide support initially; throughout the night you may start to sink, which can be bad for your neck and spine. Feather quills can sometimes poke through the fabric which is uncomfortable and they will need to be pulled out. While this might seem fun for the first two or three (and supposedly it’s good luck! ), eventually you will start to feel the effects of less feathers. Some pillows have a plastic layer to prevent this happening, but this in itself has problems as it may be noisy. While feather pillows may not be suitable for someone with a more sensitive back and neck, they are certainly a reliable choice if you’re after an affordable, comfortable and long-lasting pillow, especially if you love the feeling of sinking your head down after a long day! Polyester fibrefill is another popular choice thanks to the fact that they are low cost and readily available. Fibrefill is a man-made fluff and pillows containing polyester fibrefill hit the market in the 50s, swiftly pushing many other materials to the back of the shelves. 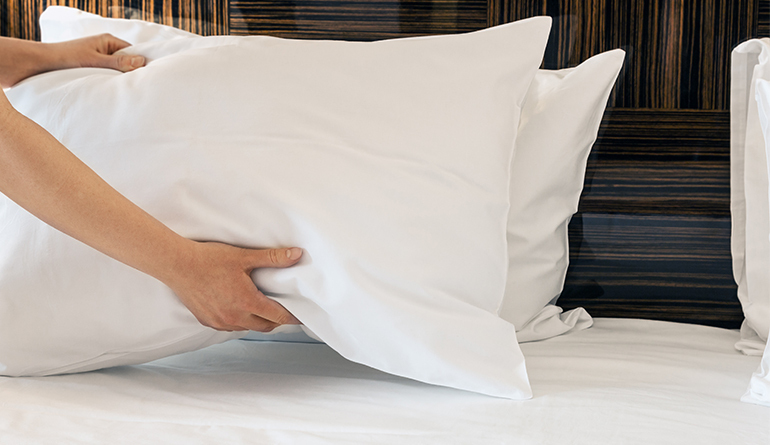 Like down or feather pillows, polyester fibrefill pillows are sold in various levels of firmness, meaning there is generally something for everyone. They are also easy to clean – as they can be machine washed and dried – making them a great choice for busy parents, or those who simply want something cheap and cheerful! Other selling points is that they are lightweight, usually quite soft and odor free. There’s a lot of good when it comes to polyester fibrefill, but unfortunately also a few drawbacks. Firstly, polyester fibrefill isn’t very breathable. The air doesn’t circulate well through the synthetic material, meaning it may be uncomfortable in summer or on hot days. The material used also clumps together very easily, especially as your pillow ages. They also flatten faster than many other materials. Finally, they are not resistant to dust mites meaning they won’t work for people with allergies, and the production of the polyester fibres also involves harsh chemicals and toxins. This makes them not only damaging for the environment but also potentially your health. While we haven’t sung the low-priced polyester’s praises very well, there is certainly lots to love. If you want a cheap, relatively comfortable pillow that you are willing to replace every once in a while, polyester fibrefill could be your go-to. Next up is the buckwheat pillow and no, buckwheat isn’t just something you find added to smoothies in health food stores! It actually makes a decent pillow filling and we’re not the only ones who think this judging by their rapidly increasing popularity. Buckwheat pillows are filled with natural buckwheat hulls, the hard, outer shell that houses the buckwheat seeds. They have been used in eastern Asia for centuries and are now growing in popularity in the Western world. There’s lots to love about the buckwheat pillow. They are supportive, moulding to the shape of your neck which helps to reduce neck pain in a similar way to the memory foam. Unlike memory foam however, buckwheat pillows are very breathable – allowing air to circulate and keeping you cool during the night. Any eco-warriors among you will love the fact that buckwheat hull is very environmentally friendly, unlike many other man-made pillows. The light sleepers among you may want to look for something else. Buckwheat pillows make a rustling noise when moved, meaning you may wake up in the night convinced there is something inside your pillow! They’re also heavy, weighing up to 8lbs so it’s not ideal for taking anywhere with you. They may be too hard for someone who prefers a softer pillow, and they are difficult to clean, taking an exceedingly long time to dry. Finally, if exposed to water and not dried properly, the buckwheat hulls may rot which will give your pillow a musty and unpleasant odor. Microbead pillows are filled with round polystyrene beads, like what we would find in bean bags. The pillow is usually made of a soft, elastic material like lycra or spandex. Almost all microbead pillows are very different to your standard pillow. They are usually designed specifically for travelling, in small cylinder shapes, so it’s unlikely you will find one suitable to have on your bed! Microbead pillows have a bit of a bad rep – but they do have some selling points. They make excellent travel pillows. Small U-shaped microbead pillows are soft and squishy, easily moulding around your neck providing somewhere for you to rest your head on long flights or car journeys. Anyone conscious of the environment should be wary of microbead pillows. Recently the UK have banned microbeads in cosmetics and personal care products due to the significant damage the plastic can have on the ocean. Secondly, while travel pillows are certainly comfortable on the go, they can be noisy and are also a potential choking hazard for babies. While microbead pillows are extremely comfortable, the damage the plastic can have on the ocean makes them a no-go for many people. If you’re concerned, it’s best to choose something more eco-friendly. Next up is latex which can be both natural and synthetic (or a mixture of both). While natural latex is derived from tree sap, synthetic is made up of various chemicals. Blended latex is a mixture of both natural and synthetic. When latex is foamed to make pillows, it generally has a good amount of spring to it. For this reason, latex pillows are often compared to memory foam, with many people who want something a little more supportive choosing one of the two. However, there are certainly some factors that might make a latex pillow a better option for you. Latex pillows have a great amount of firmness which will support your head and neck while sleeping. This can do wonders when it comes to preventing and easing neck pain. Both natural and synthetic latex are allergen free and resistant to dust mites. Finally, they are durable and hypo-allergenic meaning they are easy to clean and last for a long time. Many people swear by their comfort, and they ventilate air better than memory foam. However, all this comes at a price. Literally. Latex pillows are one of the most expensive pillows on the market. However, if money isn’t an issue and you want to invest in a durable, luxurious and most importantly, comfortable pillow, then latex is a fantastic choice for virtually anyone. Created from the flowers of the Kapok tree native to Mexico, Kapok pillows are soft, fluffy and cotton-like. Kapok sales have declined recently due to the introduction of polyester. Kapok is often used as an alternative to other soft, fluffy pillow materials such as down or feather. People are drawn to the fact that it is cruelty-free and natural. It doesn’t contain toxic chemicals and is totally compostable and biodegradable. Kapok pillows often have a zip on one side, meaning you can easily reduce or increase the amount of filling. However, it doesn’t mould to your shape in the same way memory foam or latex might, instead feeling more like a down pillow – with that ‘sinking’ feeling great for comfort but less effective at easing back pain. Unfortunately for candle lovers, kapok is extremely flammable, which is one of the reasons for its decline in popularity. It can also be lumpy, as the kapok clumps together, and, as mentioned earlier, it doesn’t hold its shape particularly well. Kapok is ideal if you are after a cruelty-free, environmentally friendly and chemical-free version of down or other softer pillows, but in terms of comfort or neck support, Kapok pillows offer very little. Next up is the rather unconventional water pillow. Contrary to belief these aren’t filled to the brim with water, we can’t imagine this would be very comfortable! Instead, they are part-filled. The top part of the pillow is usually made from polyester while the bottom contains water. Water pillows have a lot of selling points. They stay cold, meaning there’s no flipping the pillow over in the middle of the night. This makes them a fantastic option for those who suffer from night sweats or often get too hot in the night. The height and firmness is adjustable making them a good choice for people who are a little pickier, as you can simply add or remove the amount of water needed. Finally, water pillows will mould to the shape of your head and neck, making them a great alternative to memory foam or latex as they can help ease neck and back pain. Water pillows are heavy, meaning they are not good for travelling. They can also be pricey. If, however, you’re after something to keep you cool in the night, the cost of a water pillow is more than worth it. Gel is often added to memory foam or latex pillows for extra comfort. The pillows are infused with gel beads which bond with the memory or latex foam. Gel pillows are great at keeping cool. When the beads bond to the foam they create an airflow, helping your pillow to stay cool and making your night more comfortable. Other than this, gel pillows offer all the same benefits as memory foam or latex – they are supportive and sturdy, with the added bonus of regulating temperature and absorbing heat. One thing that puts people off gel infused pillows is that it can reduce the durability of your pillow. The gel beads eventually break down the cellular structure of the foam meaning a new pillow will need to be purchased sooner than it would without the gel. While memory foam and latex foam pillows are already rather costly, adding gel only adds to this cost. While the price difference isn’t enormous, adding just a little extra to an already costly item can make a big difference – especially when the durability is then lessened. When shopping for a gel infused pillow, it’s important to be conscious of the amount of gel used. Buying a cheaper pillow with less gel is virtually pointless and you’re unlikely to notice any difference. Instead, try to find something that contains around 30% gel to get the best value for money. We hope this article has given you some insight into the best pillow material for you – we think we have managed to cover just about all of them! As with everything, it’s important to determine your priorities before diving in and making a purchase. Is it important that your pillow provides adequate support? Do you hate getting too hot in the night? Is environmental impact a factor? Making a list of your priorities will help ensure you choose the perfect pillow for your needs.